Ephippiorhynchus is a small genus of storks. It contains two living species only, very large birds more than 140cm tall with a 230-270cm wingspan. Both are mainly black and white, with huge colourful, mainly red and black bills. The sexes of these species are similarly plumaged, but differ in eye colour. The members of this genus are sometimes called "jabirus", but this properly refers to a close relative from Latin America. A prehistoric relative, Ephippiorhynchus pakistanensis, has been described from Late Miocene fossils found in Pakistan. These large wading birds breed in marshes and other wetlands, building a large, deep stick nest in a tree. Like most storks, they fly with the neck outstretched, not retracted like a heron; in flight, they present a strange shape, with the head and large bill somewhat drooping down. They are silent except for bill-clattering at the nest. 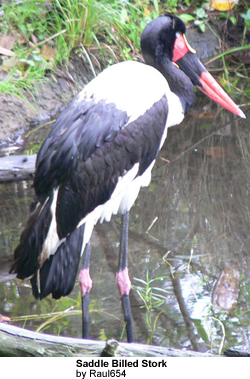 Ephippiorhynchus storks, like most of their relatives, feeds mainly on fish, frogs and crabs, but also on young birds, and other land vertebrates. They move in a deliberate and stately manner as they hunt, in a similar way to the larger heron. These birds are not infrequently kept in captivity by zoos or aviculturalists. Individuals occasionally escape, and these have been proposed to be responsible for sightings of "Big Bird" cryptids; the Saddle-billed Stork is the most likely basis for the Kongamato. The genus name Ephippiorhynchus is derived from Ancient Greek ephippos, a saddle (literally "something which is placed on a horse"), and rhynchus, "bill", and refers to the frontal shield which saddles the bill of one species.